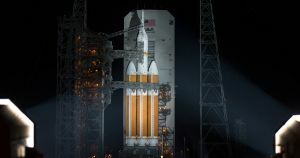 After multiple delays, bad weather, and a dramatic last-second abort, the United Launch Alliance (ULA) is hoping to finally send a top secret spy satellite into space today. The satellite is scheduled to launch on top of a ULA Delta IV Heavy rocket from the Vandenberg Air Force Base in California at 2:05 p.m. EST. According to the ULA, it’s the 38th time a Delta IV rocket has been launched since 2002. A handful of failed attempts have delayed the launch of the mission that was originally scheduled for early December. A launch attempt in mid December was aborted when engineers noticed a hydrogen leak coming from one of the boosters. More issues with the rocket delayed launch again earlier this month. ULA vice president Gary Wentz called the mission a “high-priority mission for the nation’s warfighters” in a statement earlier this month. But otherwise, details about the satellites on board are sparse. In fact, the mission is so classified, the public stream of the launch will cut out after only six minutes to protect NRO’s mission from prying eyes, according to Space.com. But you’ll be able to live stream those first few minutes on ULA’s website. Elon Musk Is Arguing With Spaceflight CEOs on Twitter. Again.